Well, technically, they’re feral. About a dozen horses live on the populated side of Unalaska Island, and they can occasionally be spotted near Summer Bay or Morris Cove. Some say they’re leftover cavalry horses from World War II; others claim that they’re descendants of horses brought over by the Russians. It seems, though, that they were formerly ranch horses that were left to roam about a decade ago. The horses are remarkably friendly. They’ll walk over to you expecting an apple or some oats, as they’re used to being fed by the community. Even if you don’t have any food on you, some of the horses will still let you pet them and they may even nuzzle you back. In 2008, all the stallions in the herd were gelded. 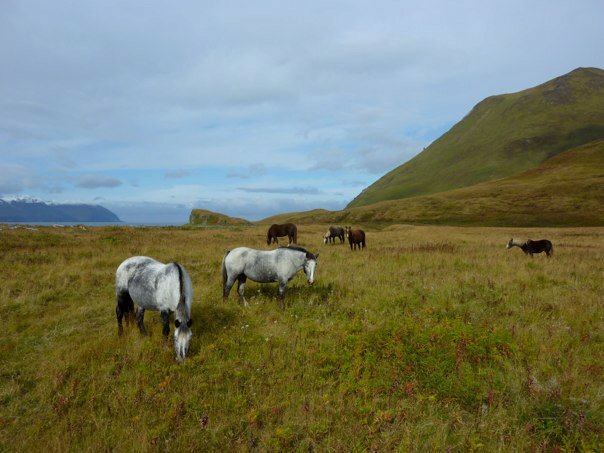 As they’re a non-native species, the horses were deemed to be harmful to Unalaska’s ecosystem. Specifically, there were concerns that all their tromping around could affect the salmon population. Not too long from now, the eagles will go back to being the biggest creatures on the island.